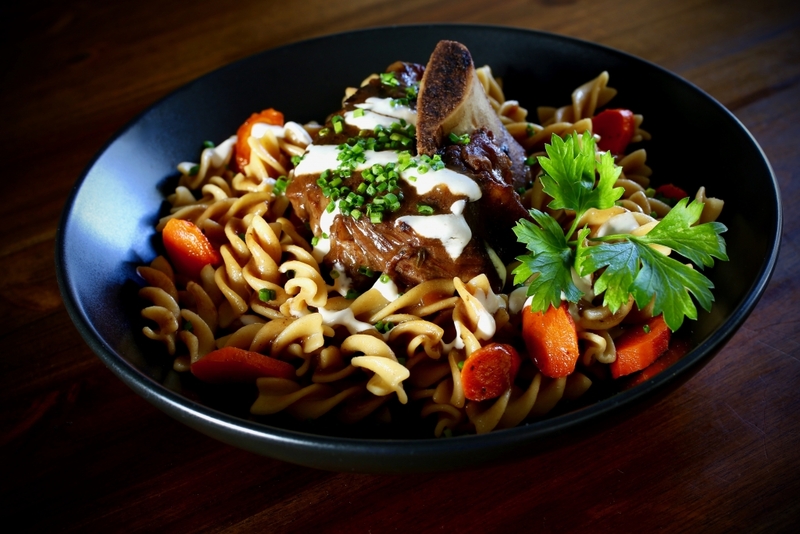 Braised Short Ribs over Chickpea Fusilli is the second of two very popular dishes we served at “Sip & Savor: A Gluten-Free Experience” to support the Celiac Disease Foundation on behalf of Explore Cuisine. Often, gluten-free dishes are vegetarian, as many health conscious consumers fall into both categories. 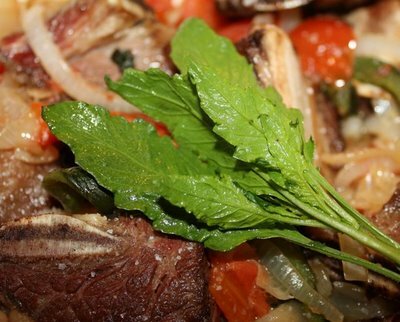 However, there are several people with Celiac disease that are neither vegetarian nor vegan and simply crave dishes that are traditionally made with wheat, such as short ribs with buttered egg noodles. Our dish is a gluten-free version of that crave-worthy meal. We substitute Explore Cuisine chickpea fusilli for the noodles and use gluten-free flour in the preparation. 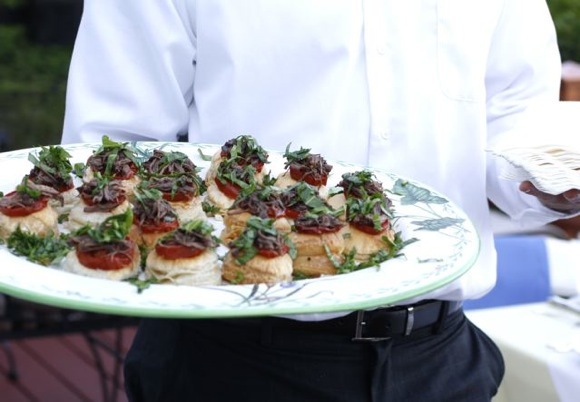 Of the seven courses we served at our fundraiser dinner, the black course is my creative favorite. I looked to Mexican cuisine experts – Chefs Rick Bayless, Patricia Quintana, and Javier Plascencia for inspiration. 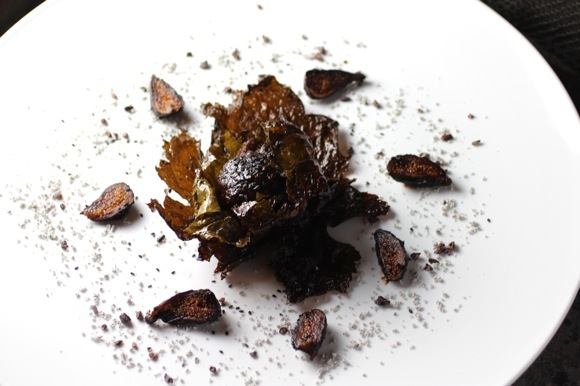 I learned about making sesame ash while Guest-Chef-for-the-Day at Moto Restaurant in Chicago last January and had been wanting to try Chef Homaro Cantu’s modernist technique in a dish ever since. What appears to be ash is black sesame seed oil converted into a powder. 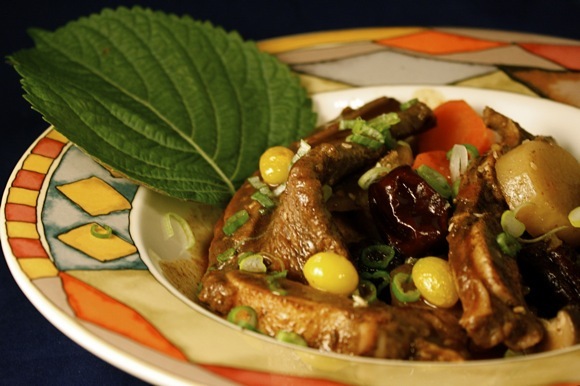 It serves visual interest as well as a flavor complement to the sesame seed in the mole. The magic of Galbi 갈비 is in the marinade. 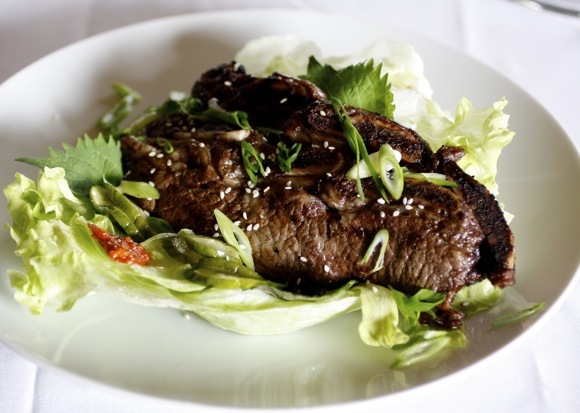 Asian pear tenderizes the meat and adds a hint of sweetness. Pear – combined with garlic, onion, and ginger, plus soy sauce, mirin, honey and sesame oil result in a full Korean flavor explosion. This entire marinade is made in a food processor, it couldn’t be easier. The ribs are rinsed, coated, then left to marinate for eight hours. Hours of marinating result in the tender yet chewy texture. 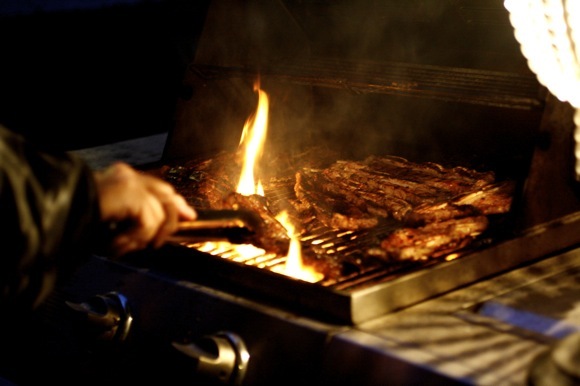 Grilling imparts a wonderful smoky note to the already complex flavors of the marinated meat while the honey and sugar caramelize into a slightly sweet glaze – making this an absolutely irresistible barbecue dish. pickled cucumber, perilla, and iceberg lettuce. 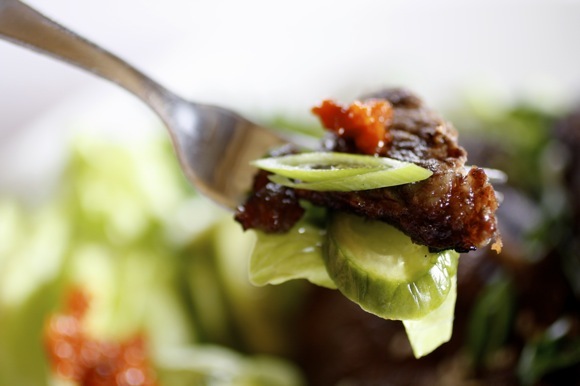 Use a knife and fork or wrap all the ingredients in a lettuce leaf for one delicious bite. Inspired by the Chefs and traditional ingredients at last week’s Top Chef Korean Food Challenge in San Diego, Galbi Jim was the first of many Korean dishes I’ve prepared since arriving back home. It was my pleasure and honor to be invited to the event as one of six food blogger judges. There, I discovered a new love, Hansik (Korean food)! May I offer you an appetizer? 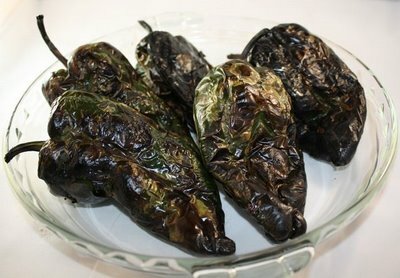 Cover the hot charred poblanos with a kitchen towel and let stand for 5 minutes. 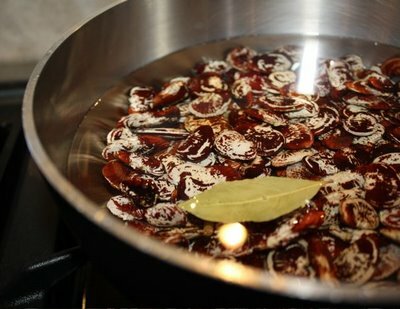 Remove the skin and seeds, slice into strips. Set aside. 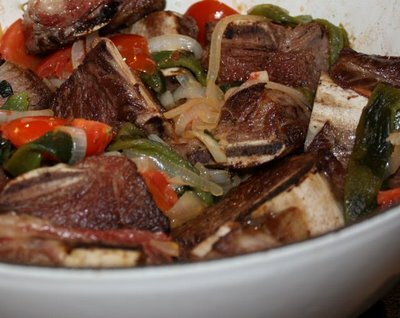 The short ribs are browned in my Le Creuset French Oven, then removed from the pan. Sliced onion is cooked until golden, then add finely chopped garlic. Chopped tomatoes are added, cook for about 3 minutes more. 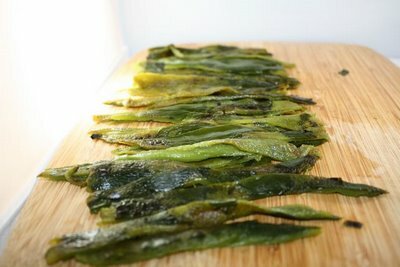 The sliced poblanos, browned short ribs, plus salt and epazote are all nestled into the pan, covered, and braised at 325°F for about 1 1/2 hours. 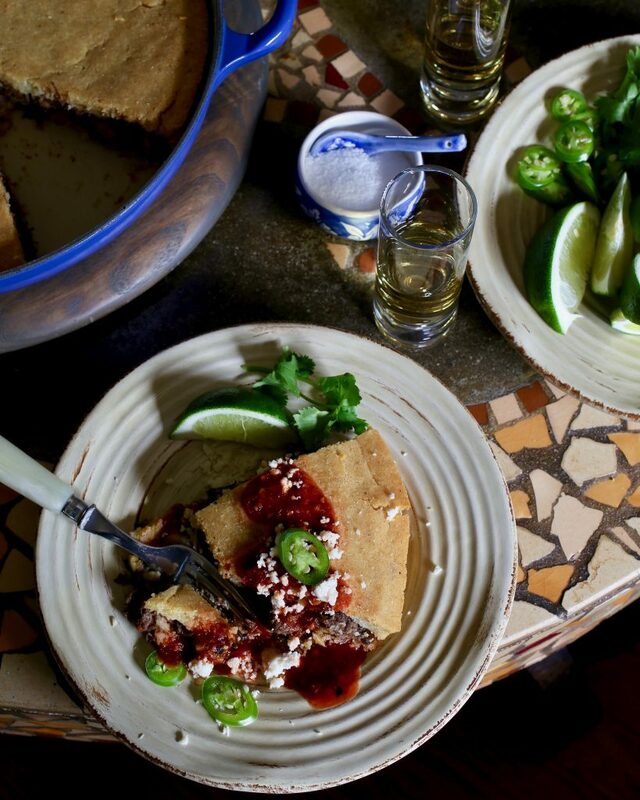 The epazote gives this dish its traditional Mexican flavor. I have fallen in love with this herb and its intriguing aroma reminiscent of kerosene. 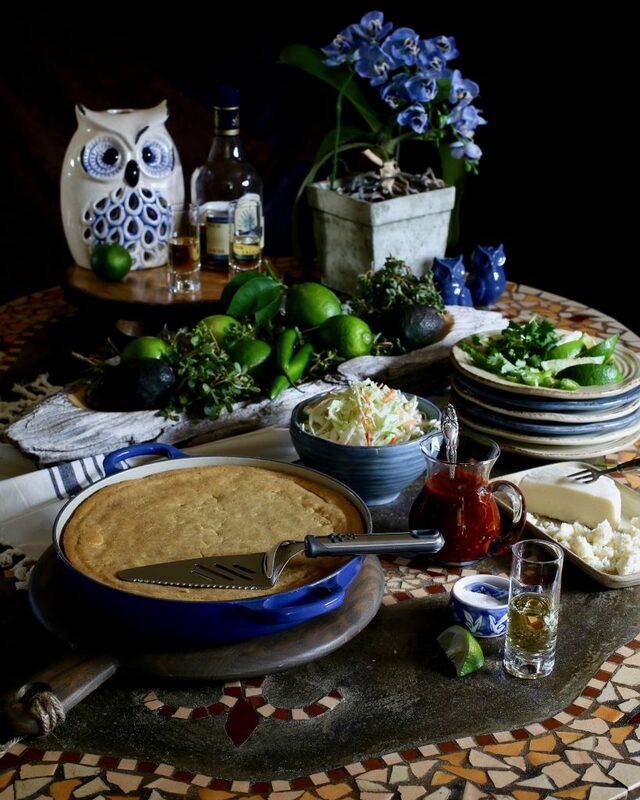 This fabulous dish is the creation of Chef Rick Bayless. The detailed recipe can be found here. I made this dish for my brother Bill. Knowing I was preparing a meat dish with Mexican origins, he stopped at the wine shop on his way over. 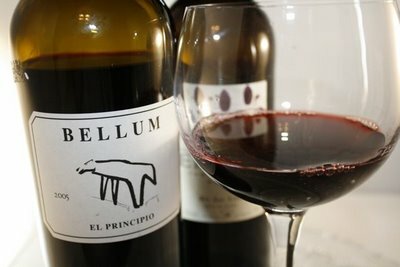 The Bellum El Principio 2005 was one of two excellent recommendations. This is a Spanish wine made from 100% monastrell old vines. A complex and earthy wine, somewhat spicy, with a mixed berry fruit character, powerful yet smooth. The name “Bellum” comes from a local prehistoric cave painting. Perfect pairing with Beef Short Ribs and Poblanos! Thanks Billy. We enjoyed this dish with white rice and Christmas Lima beans. I sent Bill home with some leftovers and when we talked later in the week, we both agreed that this dish was even better the next day! I’ve long been a fan of Rick Bayless and his restaurants in Chicago – Frontera Grill and Topolobambo. ¡Muchas Gracias RB!